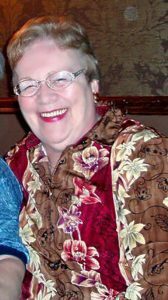 Carole Wood, 78, died on Jan. 31, 2019, after a long battle with Alzheimer’s disease. Carole last resided in Vineyard Haven, with her husband Robert “Woody” Wood, yet they have established roots with family and friends in the towns of Nantucket, Pembroke, and beyond. Carole was an important partner with her husband Woody. Together they operated an auto-parts business on the islands of Martha’s Vineyard and Nantucket for over 20 years. Carole, with Woody by her side, was more than a parent. Carole and Woody’s business continues to provide the livelihoods of half their family, as well. Carole will be remembered for her positive impact on the lives of many. Carole leaves behind a large, loving family consisting of two sisters (Deborah and Cheryl), seven sons (Jack, Wes, Larry, Bill, Rob, Dave, and Derek), 11 grandchildren (Christina, Melissa, Joanna, Billie, Allie, Amy, Racheal, Margaret, Ashley, Brendan, and McKenna), and 14 great-grandchildren (Samantha, Tori, Joseph, Adrian, Emma, Connor, Tristan, Mason, Christian, Cadence, Hayden, Billy, Michael, and Jay). Family, friends, and loved ones are invited to attend services and share their wonderful memories at Shepherd Funeral Home, 7 Mattakesett St., Pembroke, 02359, on Thursday, Feb. 7, between the hours of 10 am and 1 pm. In lieu of flowers, the family recommends donations to the Senior Behavioral Health Clinic at Beth Israel Deaconess-Plymouth at bidplymouth.org/donate-now, or to the Alzheimer’s Association at alz.org. The post Services Thursday for Carole Wood appeared first on The Martha’s Vineyard Times.